On this page we want to give a little overview on our works and what we offer. Perhaps you did already come up with software for sailors and motorboaters which seems very promising at first sight, but by using it you have a feeling that the devlopers have never been on a trip with a yacht. We had this feeling quite often while testing new software. 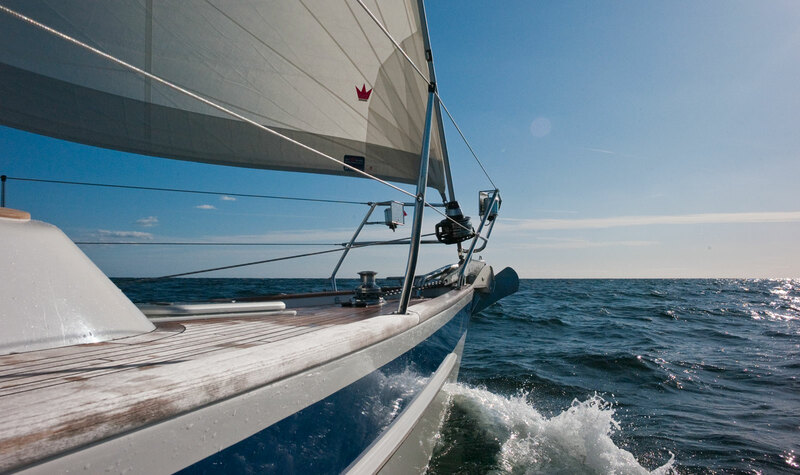 This is the reason why we decided to develop software by sailors for sailors and motorboaters. A strong team of experienced developers and designers—all with high practical relevance—is the basis of 2K Yachting. 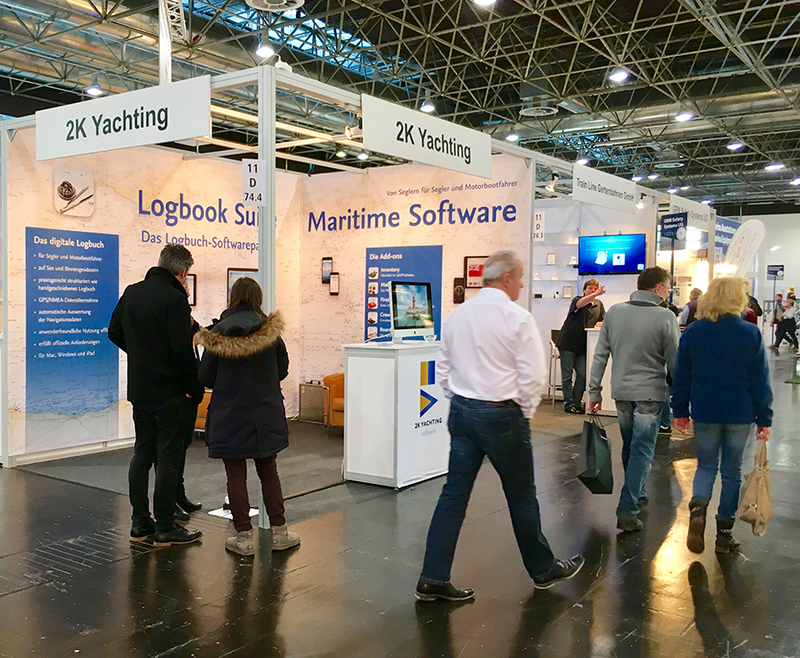 On the pages Logbook Suite and Apps you can discover our selection of user-friendly software for sailors and motorboaters. 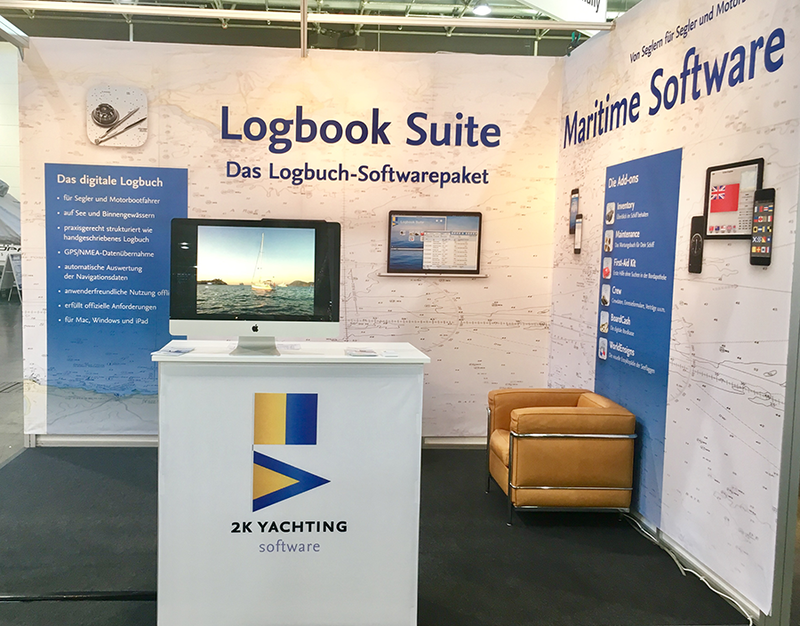 The popular software package Logbook Suite (for Mac, Windows and iPad) provides additionally to the digital logbook Logbook a selection of useful tools for sailors and motorboaters, called Add-ons. The apps Ship's Bell (for iPhone), WorldEnsigns (for iPad and iPhone), SignalFlags Tool (for smartphones and tablets with iOS and Android), BoardCash (for iPhone and iPad), and RegattaPlanner (for iPhone, iPad and PC) complete our range of software. 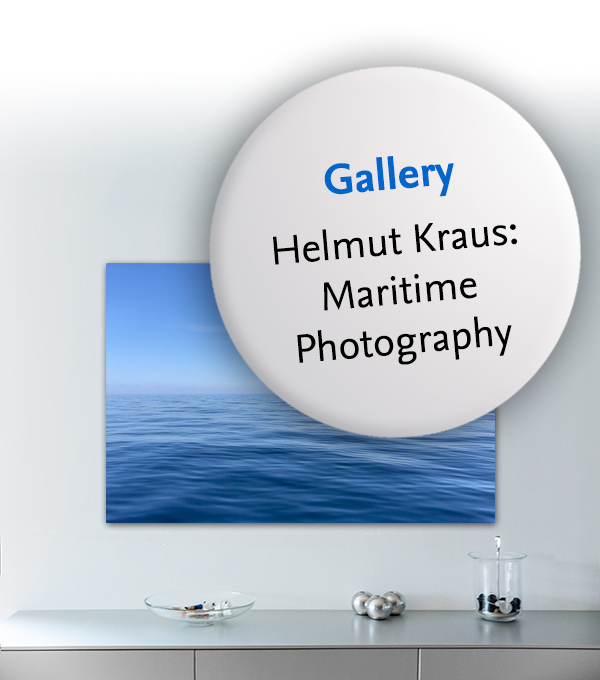 Experience the fascinating beauty of seascapes, captured and composed by the Düsseldorf-based photographer Helmut Kraus, DGPh. He photographs his remarkable works during sailing trips on the North Sea, Baltic Sea, the Atlantic Ocean and the Mediterranean Sea. 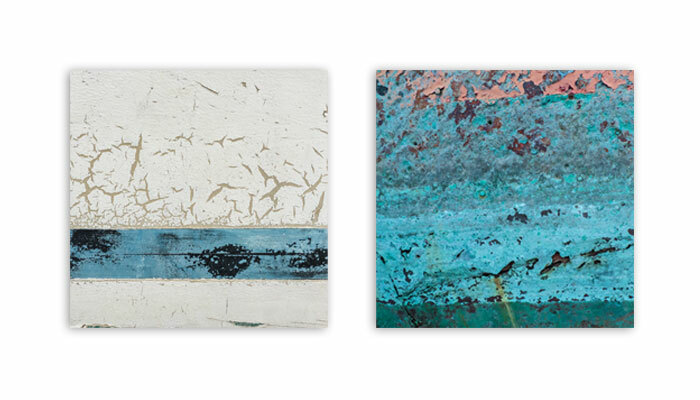 Discover the Editions of the Maritime Photograhy in our online shop. All photos are first mounted behind an acrylic glass plate for a luxurious finish and then mounted to Dibond to guarantee a gallery quality. Visit our virtual Photo Gallery. The popular logbook software package for PC and iPad with special features for sailors and motorboaters for journeys at sea and on inland waterways. Have any important data on your crew, the ship and all your voyages to hand and create with only a few steps forms and agreements for your travels and your crew. The handy board cash box is a useful Add-on for your Logbook or a great standalone app for the iPhone and iPad. Keep track of indication, expiration date and storage location of all medical aids in your ship's first-aid box. The administration tool to keep track of all the things that are stored in the ship. It is a useful Add-on for your Logbook or a great standalone tool. The maintenance book for your ship: Use Maintenance to plan, schedule and document all your maintenance works, repairs and new installations in your ship. A new version for Crew with an optimized internal data structure is now available for download via the Logbook Suite Manager. Read more about the changes here. For those who have experienced problems with Logbook in Logbook Suite 1.4, now version 4.0.3 is available for download via Logbook Suite Manager. Read more about the changes here. From today the new version 1.4 of Logbook Suite with Logbook 4 is online. The with Logbook 4 new Auto-NMEA function is able to independently record GPS/NMEA data and save it in the background. This allows Logbook to make fully automatic logbook entries and draw a detailed track. Of course Logbook Suite 1.4 brings many more new features to Logbook and the Add-ons. Learn more about the new features here. Logbook Suite 1.3 (4) is available now. The free update contains the first major update of Biography (1.1) and minor corrections in almost all tools. To update the existing installation, simply download the iPad update from the App Store or download and run the new installers for Mac and Windows. This will replace the current program installation. Customers who own a PC license for Logbook will find the installer in their shop account and do not need to fill out the form. All data files with default names are automatically updated during the update. Learn more about the changes here. An update for the iOS App BoardCash to version 2.0 (2) with BoardCash 2.3.5 is available in the App Store. In addition to minor bug fixes, the new web address of the ECB for downloading exchange rates has been implemented. All fixes are listed here. If you don't see the version number 1.3 (3) on the start screen after updating to Logbook Suite 1.3 (3), please download and run the installer again from our website. Unfortunately in some places the installer was not replaced with the latest version. We have fixed this now. This applies to the installers for Mac and for the Windows 64-bit version. Logbook Suite 1.3 (3) is available from today. This free update includes minor fixes in all modules. To update your existing installation, just download the update for iPad from the App Store or reload and run the installers for Mac and Windows. This will replace your current program installation. Customers who own a PC license for Logbook will find the installers in their shop account and do not need to fill out the form. During the update, all data files with default names are automatically updated. All manuals are now available in the download area in the new version updated for Logbook Suite 1.3. The user manual for Logbook 3.10 is now available in our download area. The basics user manual for Logbook Suite 1.3 is now available in our download area. The user manual for the new version of BoardCash is now available in our download area. After we had to remove the iPad version of Logbook Suite from the App Store on Monday evening to fix a bug in the data update, since this morning the new version 1.3 (2) is now available. Logbook Suite 1.3 (1) is available now. This free update fixes startup problems that occurred on some Macs and iPads, and includes minor fixes in all modules. Learn more about the changes here. To update your existing installation, just download the update for iPad from the App Store or reload and run the installers for Mac and Windows. Customers who have a PC license for Logbook will find the installers in their shop account and do not need to fill out the form. Logbook Suite 1.3 is available now. And the update is for free, as usal. Read more about the new version here. BoardCash 2.0 is now available on the App Store. The update is for free, as usal.BoardCash 2.0 is compatible Logbook Suite 1.3. Read more here. LogbookNMEA connect 2.1 is now available on the App Store. LogbookNMEA connect 2.1 is compatible Logbook Suite 1.3. Read more here. Look forward to the next version of Logbook Suite, which will be available soon. The free update comes with many new or improved features in Logbook and Add-ons and with the new Add-on Biography. You can already find out more about Biography here. We have tested some NMEA multiplexers with Logbook and discovered the NMEA 2000 WiFi Gateway YDWG-02 from Yacht Devices, a small, easy-to-install device for NMEA 2000 networks. Reade more. Good news for all users of Logbook Suite, BoardCash and RegattaPlanner on the iPad: The latest update for the iPad app Dropbox fixed the bug that could cause problems when saving files from our apps to the dropbox. After 9 busy days the boot Düsseldorf has closed. Thank you to all who visited us! 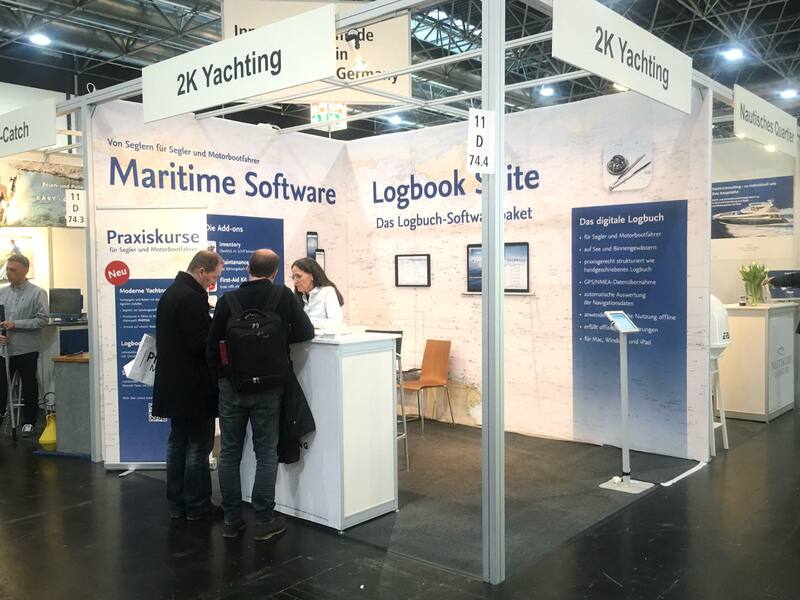 boot Düsseldorf has just started today... Do you want to learn more about our maritime software? Then come by and say hello. You will find us in hall 11. We would like to inform you that the Dropbox app on iOS 11 is not compatible with our apps Logbook Suite, BoardCash and RegattaPlanner. Therefore, currently files should not be stored in the Dropbox. It is recommended to copy files using iTunes or to use a different cloud platform. We hope that there will soon be an update for the Dropbox app that will solve the issue. Our new software RegattaPlanner is available for download and free testing. The versions for Mac and Windows can be downloaded from our website, the iOS version is available in the Apple App Store. You can find out more here. We are happy to announce our new software RegattaPlanner. The software will soon be available for iOS, Mac and Windows. Read more here. Logbook Suite 1.2 is available now. And the update is for free, as usal. Read more about the new version here. The free update comes with many new or improved features in Logbook and Add-ons and with the new Add-on Scheduler. You can already find out more about Scheduler here. Tonight the boot 2017 closed its doors after 9 days of fair. 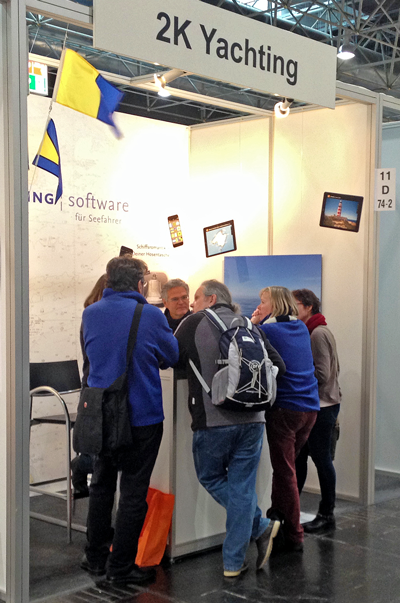 We again had been present with our booth and had been able to demonstrate Logbook Suite to many interessed visitors. It was very inspiring for us to talk with so many customers who already use Logbook Suite. The list of ideas for expanding the suite has grown. Many thanks to all visitors at our booth! 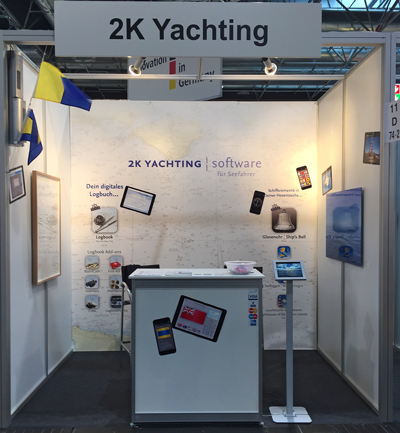 This year again we present our software at boot in Düsseldorf. We are looking forward to your visit: Hall 11, booth D74.4. Our new iOS app BoardCash can now be downloaded from Apple App Store. For more information on the app BoardCash use this link. With our new iOS app BoardCash you can now make your cash book entries on the iPhone. The app is fully compatible with the Logbook Suite Add-on BoardCash. More about this next on our website. A new version of the user manual for Logbook can be loaded from our download page. The new manual includes all the functions of Logbook 3.8.1. Logbook Suite 1.1 is available now. And the update is for free, as usal. Read more about the new version here. Coming soon: In a few days the free update to Logbook Suite 1.1 is available. All recipients of our newsletter will be informed. categories for the medicine Add-on "First-Aid Kit"
An update to our popular app Ship's Bell is available in Apple App Store. The update fixes a bug that could occur when switching to DST. Due to requests of our customers we have developed a 32-bit version of Logbook Suite. You will receive the download link when you fill out our download form. The Swedish translation of the user manual for Add-on BoardCash is available for download. This update fixes a few minor bugs in Logbook and some Add-ons. More here. The Swedish translation of the user manual for Add-on Crew is available for download. The Swedish translation of the user manual for Logbook 3.7 is available for download. The new version 2.0 of our app LogbookNMEA connect is available in App Store for download/update. Version 2.0 has been optimized for iOS 9.2 optimiert and supports more devices. who come numerous. We say thank you for the interesting conversations and look forward to many more. Logbook 3.7 – the new version of our popular logbook software is available now. Customers who already own a version of Logbook , can download the new version of Logbook and the Add-ons for free from their Shop account. All serial numbers are still valid. In a few days the new version Logbook 3.7 will be available. Logbook 3.7 provides both in Logbook itself and in the Add-ons many small improvements and enhancements of existing features. A new addition is Swedish as a third language for the user interface. The completely re-programmed version 2.0 of our popular iPhone app Ship's Bell is now available in Apple App Store - new, modern design, optimized for all iPhone sizes, compatible with iOS 9. The new app for iOS and Android explains the international signal flags both used as stand-alone flag as well in combination with other signal flags. In SignalFlags tool you can also write with signal flags and decode a word written with signal flags.